This article is about the asteroid. For other uses, see Astraea (disambiguation). Astraea (minor planet designation: 5 Astraea) is a large asteroid from the asteroid belt. Its surface is highly reflective (bright) and its composition is probably a mixture of nickel–iron with silicates of magnesium and iron. It is a S-type object in the Tholen classification system. Astraea was the fifth asteroid discovered, on 8 December 1845, by Karl Ludwig Hencke and named for Astræa, a goddess of justice named after the stars. It was his first of two asteroid discoveries. The second was 6 Hebe. A German amateur astronomer and post office headmaster, Hencke was looking for 4 Vesta when he stumbled on Astraea. The King of Prussia awarded him an annual pension of 1,200 marks for the discovery. Photometry indicates prograde rotation, that the north pole points in the direction of right ascension 9 h 52 min, declination 73° with a 5° uncertainty. This gives an axial tilt of about 33°. Astraea is physically unremarkable but notable mainly because for 38 years (after the discovery of Vesta in 1807) it had been thought that there were only four asteroids. With an apparent magnitude of 8.7 (on a favorable opposition on 15 February 2016), it is indeed only the seventeenth-brightest main-belt asteroid, and fainter than, for example, 192 Nausikaa or even 324 Bamberga (at rare near-perihelion oppositions). After the discovery of Astraea, thousands of other asteroids would follow. 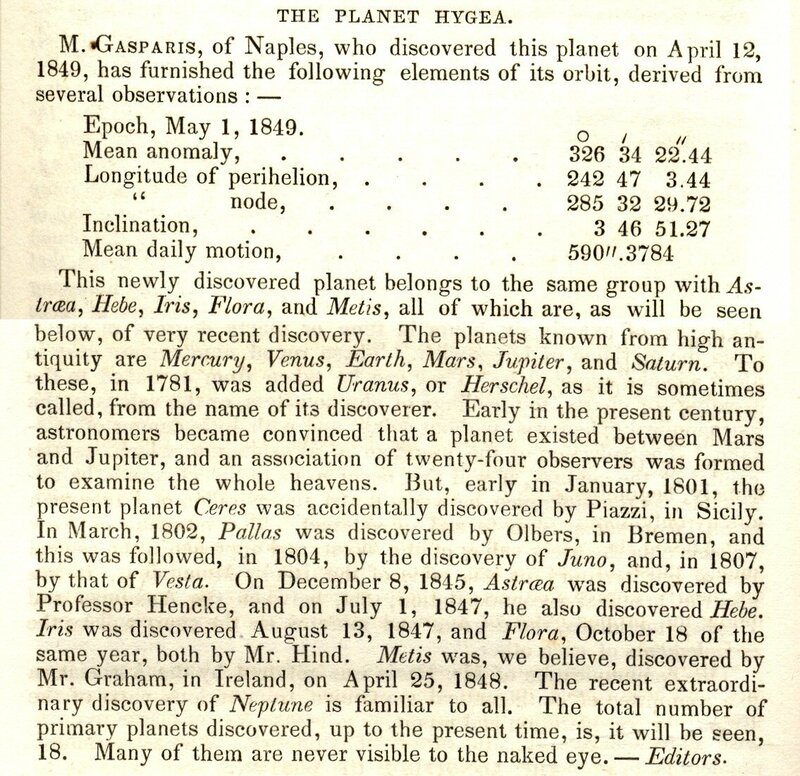 Indeed, the discovery of Astraea proved to be the starting point for the eventual demotion of the four original asteroids (which were regarded as planets at the time) to their current status, as it became apparent that these four were only the largest of a whole new type of celestial body. An occultation on 6 June 2008 produced an effective diameter (silhouette) of 115 ± 6 km. Astraea has been studied by radar. Arecibo observed Astraea in March 2012. Left: A size comparison of the first 10 numbered asteroids profiled against Earth's Moon. Right: The orbit of 5 Astraea in white compared with those of Earth, Mars and Jupiter. ^ a b "5 Astraea". Minor Planet Center. Retrieved 1 June 2018. ^ Schmadel, Lutz D. (2007). "(5) Astraea". Dictionary of Minor Planet Names – (5) Astraea. Springer Berlin Heidelberg. p. 15. doi:10.1007/978-3-540-29925-7_6. ISBN 978-3-540-00238-3. ^ a b c "JPL Small-Body Database Browser: 5 Astraea" (2017-11-22 last obs.). Jet Propulsion Laboratory. Retrieved 1 June 2018. ^ "Asteroid (5) Astraea – Proper Elements". AstDyS-2, Asteroids – Dynamic Site. Retrieved 25 May 2018. ^ "AstDyS-2 Astraea Synthetic Proper Orbital Elements". Department of Mathematics, University of Pisa, Italy. Retrieved 1 October 2011. ^ a b c d M. J. López-Gonzáles & E. Rodríguez Lightcurves and poles of seven asteroids, Planetary and Space Science, Vol. 53, p. 1147 (2005). ^ Michalak, G. (2001). "Determination of asteroid masses". Astronomy & Astrophysics. 374 (2): 703–711. Bibcode:2001A&A...374..703M. doi:10.1051/0004-6361:20010731. Retrieved 10 November 2008. ^ Michalak2001 (Table 6) assumed masses of perturbing asteroids used in calculations of perturbations of the test asteroids. ^ "Supplemental IRAS Minor Planet Survey". Archived from the original on 3 June 2016. Retrieved 12 July 2016. ^ "Dawn Community". NASA. Archived from the original on 21 May 2009. Retrieved 17 April 2009. ^ a b "The Planet Hygea". spaceweather.com. 1849. Archived from the original on 9 April 2008. Retrieved 18 April 2008. ^ Ďurech, Josef; Kaasalainen, Mikko; Herald, David; Dunham, David; Timerson, Brad; Hanuš, Josef; et al. (2011). "Combining asteroid models derived by lightcurve inversion with asteroidal occultation silhouettes" (PDF). Icarus. 214 (2): 652–670. arXiv:1104.4227. Bibcode:2011Icar..214..652D. doi:10.1016/j.icarus.2011.03.016. ^ "Radar-Detected Asteroids and Comets". NASA/JPL Asteroid Radar Research. Retrieved 23 January 2012. ^ Mike Nolan (18 January 2012). "Scheduled Arecibo Radar Asteroid Observations". Planetary Radar at Arecibo Observatory. Retrieved 23 January 2012. ^ "Planetary Radar Science Group".